Patterns of rye rDNA organization in interphase nuclei were studied through the use ofin situ hybridization in spreads of root meristem cells from plants with and without B chromosomes (Bs). In cells from plants without Bs each rDNA locus is organized as a single perinucleolar knob of condensed chromatin with decondensed chromatin inside the nucleolus. In plants with Bs there is a marked modification of the pattern, found in more than 23% of nuclei, which involves several regions of condensed chromatin interspersed with decondensed chromatin inside the nucleolus. This B-induced alteration in rDNA interphase organization suggests a change in expression of the rRNA genes located on the A chromosomes probably related to the reduction in nuclear RNA observed previously in plants with Bs. 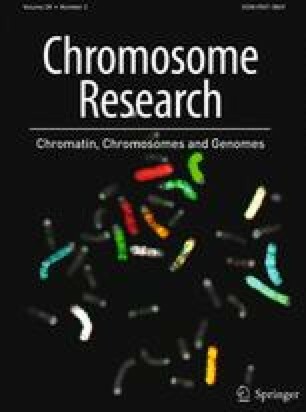 The influence of the Bs on the expression of A chromosome genes, through rearrangement of interphase chromatin, could provide the basis of an explanation for some of the known phenotypic effects of B chromosomes in rye.